Interesting Facts Crazy Quilt retailed for $3.95 when it was released in 1971. Crazy Quilt debuted in late-1971 in the “Gifts” section of the Pyrex dealer catalog. 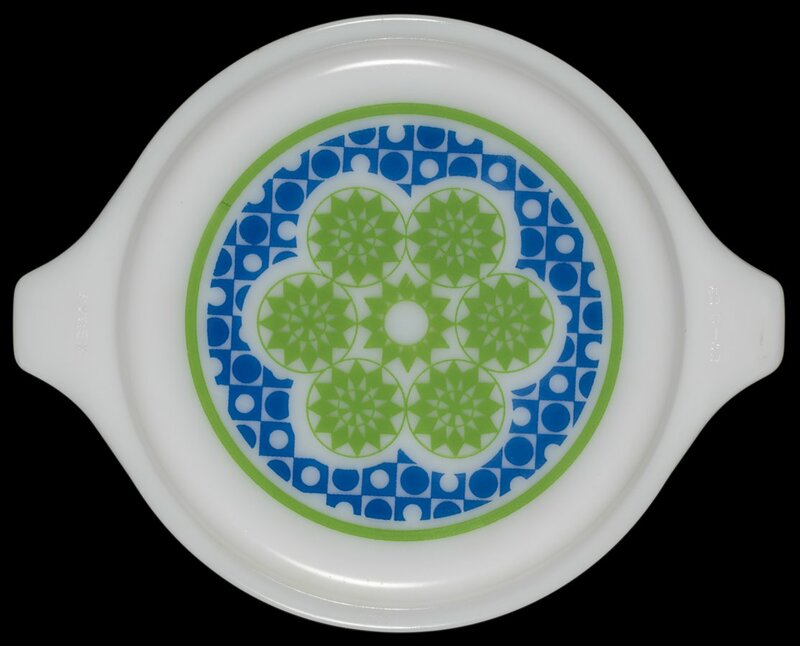 With a bright green dish and bright blue and green pattern on the opalware lid, Crazy Quilt is a great example of the trend toward bright colors in the 1970s. The Crazy Quilt pattern was released on the one-quart (473) Cinderella Casserole and came with a brass three-legged trivet. Casserole plus trivet retailed for $3.95. As the 1970s progressed Pyrex opalware promotional patterns included small three-legged trivets, under-plates and “hugger cradles” rather than traditional cradles and candle warmers.